The Broncos play their final game ever at Mile High Stadium, defeating San Francisco 38-9 before the second-largest crowd in the stadium’s history, 76,098. 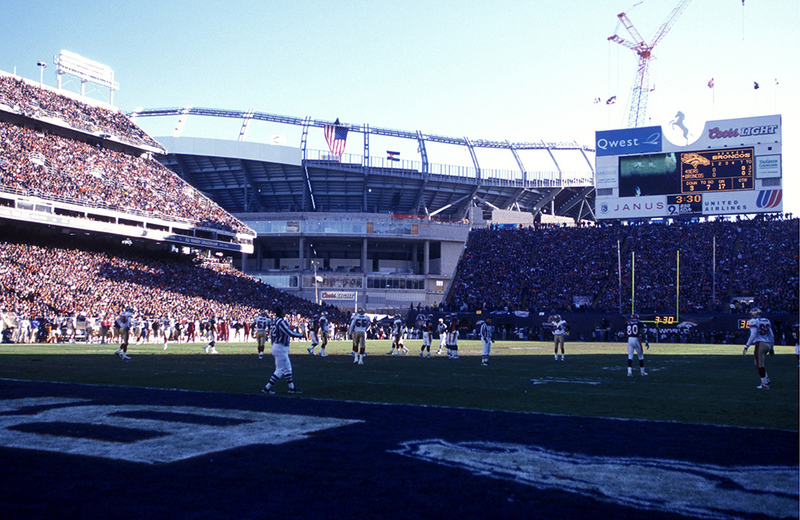 It was the largest crowd ever for a Broncos regular season game, and those in attendance were treated to an outstanding performance from the home team on this historic day. The Broncos set franchise single-season records for passing yards (4,243) and total yards (6,554) with the latter figure ranking fifth in NFL history. Ed McCaffrey and Rod Smith each hit the 100-catch mark for the season—becoming just the second pair of teammates to do so in the same season in NFL history—with McCaffrey (101) breaking Lionel Taylor’s 39-year old franchise record (100) while Smith ties it. Smith shatters the club record with 1,602 receiving yards for the season. Running back Mike Anderson sets franchise rookie rushing records with 1,487 yards and 15 touchdowns for the season.